LADC Companies has strived to put the service back into “service” since it started in 1984. Since that time LADC has delivered, as promised, its commitment to first rate quality service with in-house personnel to meet its client strict demands and expectations. Hiring LADC for your snow and ice management services is the first step to a successful winter, a safe winter! LADC Companies knows the importance of the right piece of equipment for the right job. LADC has partnered with CAT, John Deere, Artic Sectinal Snow Plows, Snowcaster and Custom Snow Tires to see that only the best and most reliable setup is on your job site to service your everday need as well as your unexpected needs. All equipment is designed specifically for snow removal services to provide 100% efficiency and various bidding formats. All work can be bid: hourly, incrementally, by the inch, or retainer. Our De-Icing fleet is designed to take the guess work of de-icing your property. From custom build salt truck and dedicated de-icing spray trucks you can intrust your property is in good hands. Give us a call today. Let your property become ones other wish to they had. With great partners comes great relationships. Intrust your property with the largest midsize CAT Equipment Fleet in North America dedicated for snow and ice management. Our desire to give the best has come to providing the best and doing so starts with the proper equipment for the job. If your previous vender has failed, or it is time for something better give the screaming eagle a call. We take snow seriously. From Winter to Spring , Summer to Fall, LADC Companies has the personnel and equipment to handle the most demanding work at a 99% efficiency rate. If it’s snow and ice management, grounds maintenance, irrigation repair and maintenance, parking lot sweeping/striping/repaving, painting, masonry, concrete, steel work or construction....LADC will get it done without the lip service. Hire the experienced! With over 34 years of superior service we strive to to bring the word service back into the word. 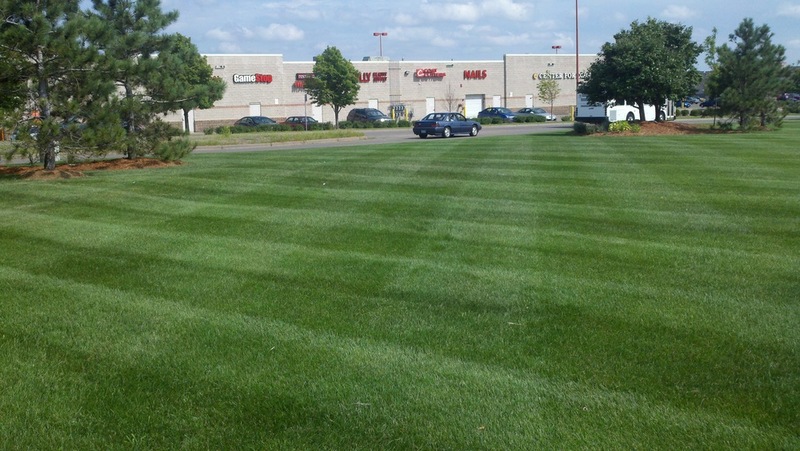 Proper weed control and fertilization are essential to optimum turf growth and vigor. The proper balance of nutrients, NPK, need to be balanced and only delivered in the amounts they are deficient. At LADC we don’t simply mow the lawn, we contour it. By alternating the direction of the mow each week, this technique strengthens the root systems while adding the dramatic visual striping as seen on may professional based fields. Secondly, the blades must always be sharp to minimize the tearing or shearing of the blade tips. With properly sharpened blades the grass will appear greener and more sculpted. Thirdly, you must never remove more than 1/3 of the blade length with each week. Finally, cut the grass longer in the summer heating months and shorter on the final to reduce the likelihood of pink snow mold. LADC uses air regenerative sweepers for most of its parking lot sweeping needs. They are the only sweeper which meets the residential noise ordinance standards and can sweep adjacent to residential homes at any time of night. At a time when water availability is a large concern, the ability to water efficiently is paramount and absolutely necessary for the survivability of your turf. Spring start up, or charging of the system, is the first time to check for immediate repairs and make head adjustment that could have been altered or damaged during the plow season. Monthly inspections provide for minor adjustments to heads and spray patterns. This is a good times to adjust the clock for water ban schedules as they change from week to week. Fall winterization involving displacement of water from all the primary and secondary lines will ensure the system will start again in the spring without repairs. LADC Companies knows the importance of the right piece of equipment for the right job. LADC has partnered with Caterpillar and John Deere to see that only the best, and most reliable, equipment is on your site to service your everyday, as well as your unexpected needs. Specialty equipmentfrom industrial snow throwers on pay-loaders, hydraulic snow throwers on skid-steers, to PTO snow throwers on tractors, can save you thousands of dollars by blowing the snow on site as opposed to hauling off site. Hi tech solutions to everyday environmental issues include LADC’s MgCl de-icing systems in lieu of salt or salt/sand combinations. This liquid anti-ice application pre and post snowfall reduce ice bonding and minimize exposure to liability due to slip and falls. LADC’s snow removal equipment parallels its need to provide efficiency and timeliness by utilizing 10’ sectional pushers on Cat Skids and, 12’ sectional pushers on Cat loaders, and salt trucks which multi task in many capacities. Since day to day activities dictate that anything and everything can happen...it invariably will. LADC’s emergency response crew can respond to most problems anywhere in the state of Minnesota within 3 hours. This unit responds with a full crew and all the equipment necessary to make any repair to lots, block work, metal work, and building. This service vehicle is equipped with welders, plasma cutter, hydraulic jacks, its own hydraulic mini track unit, paint, electrical/irrigation supplies, hoists, high level harness, generator and designed to work at any time of day or night in all types of weather. No job too small...no job too big! If there is a problem that is potentially injurious to customers or employees, LADC will work concurrently until the threat is repaired without disruption to store hours or activity. 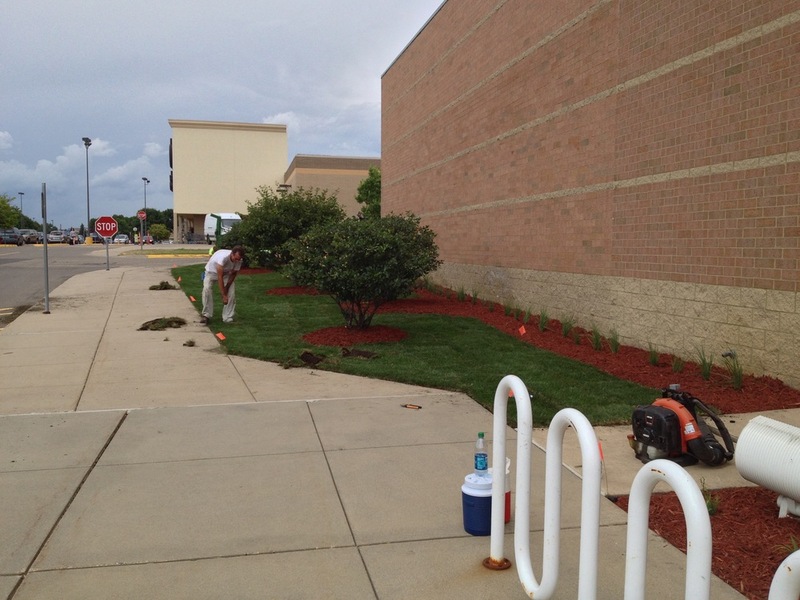 In those situation where interior remodel work or register bollards need installation, our night crew will work to minimize disruption to customers and stores busiest times. 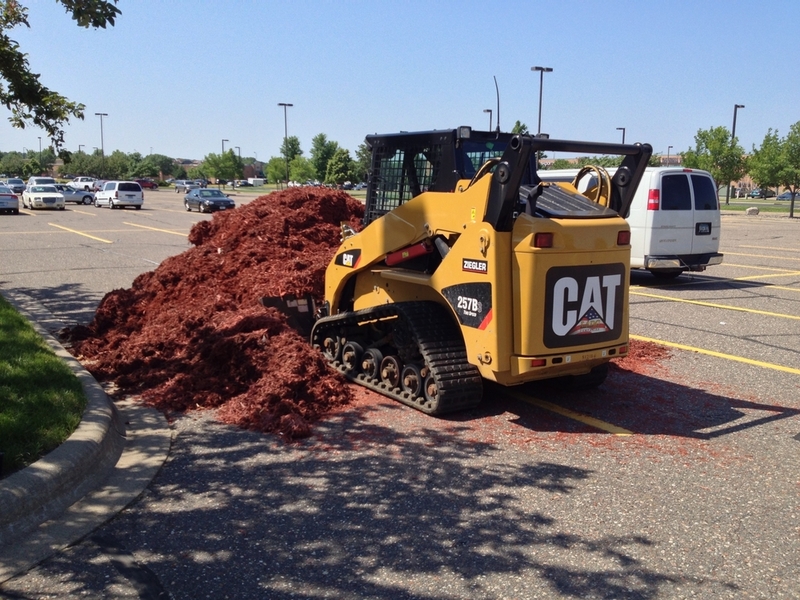 Minnesota seems especially prone to concrete damage from our winter’s freeze and thaw cycles. LADC is typically able to remove and dispose and re-pour new concrete with rebar and chairs, up to 2000 squarefeet within 12 hours, working many times in the overnight hours. If you need stairs, flatwork, or certain spec’ed concrete. LADC will provide and complete the job on schedule. When sink holes appear out of nowhere the culprit can be a storm sewer with bad bell connections on the horizontal or even failed mud rings on vertical piping. 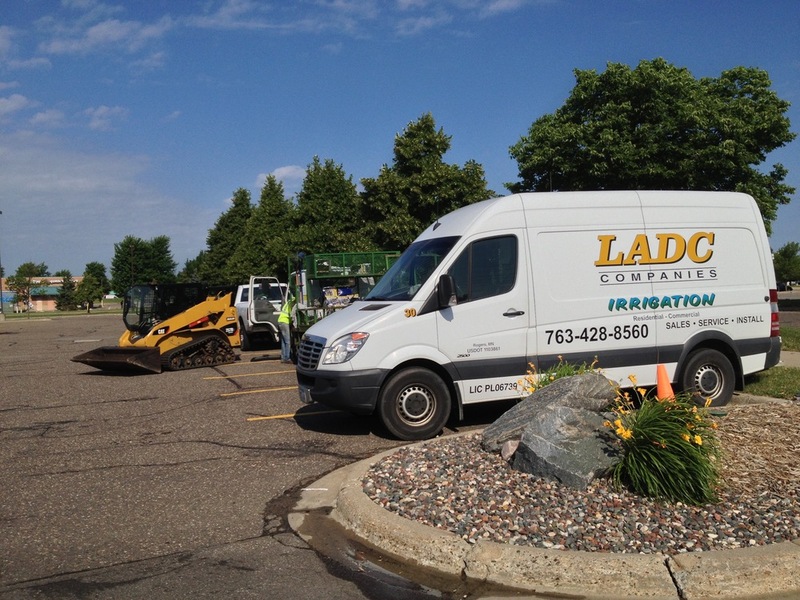 LADC can excavate to the problem, make the repair, backfill, and top-dress with new concrete or bituminous. Prior to this process, 360 degree cameras can be sent in on tracks to determine the extent of the damage. LADC’s Specialty Service Division arose out of a need by its customers to get quality repairs made in an expedited manner at a fair price. In addition to being a benefit to our customers, it also enables us to keep professional employees on staff year round by filling the holes left open by season to season transitions. In its last 28 years, LADC, has done repairs to: concrete, masonry, signage, painting, parking lots, iron work, fences, building additions, bollards, Sensormatic systems, roof systems, and storm sewers. When winter has gotten the best of us, LADC can remove the damaged concrete and install new concrete using Hi Early concrete with fiber mesh, set over rebar on chairs. During demolition, every effort is made to preserve existing in-ground security systems hardware. If in-ground systems are present, many customers take this opportunity to upgrade their hardware and we are glad to accommodate. Another upgrade that can done at this is to remove those older surface mounted bollards and sink full length steel bollards for that perfect finished look. Stop signs, handicap, no parking, fire lane, yield and truck loading signs can all be installed with 2 3/4” galvanized pipe or mounted in 7” schedule 40 steel tubes filled with concrete and painted safety yellow. All bollards are installed to no less than 42” below grade. Whether its temporary weighted bases or permanent mounting in galvanized pipe or schedule 40 steel. LADC will install it correctly at a price that fits your budget. All photos are property of LADC Companies.